The spinal region of a smoker is found to be devoid of normal blood flow, an obvious reason for numbness and pain in the lower back. Smoking interferes with the general mineral make-up of bones making them weak as well as overly brittle. The bones and joints of the human body need to go through various kinds of repairs on a regular basis, in order to function well. 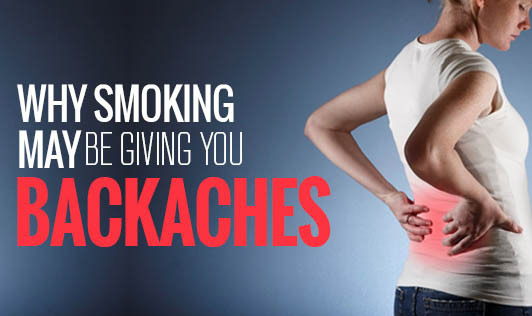 Smoking interferes with this rejuvenation process and causes back pain. If you have developed chronic cough because of smoking, then continued trauma to the chest caused due to prolonged coughing can also cause serious discomfort in the lower back region. Research suggests that a cure is impossible without quitting smoking. So if you are wondering why all the measures you have taken so far to manage lower back pain are not proving to be effective enough, you should probably pay closer attention to your smoking habit. This habit of yours may be diluting all the efforts taken by you. Quit Smoking Now! You will be doing a load of good to your body, including your lower back.